Our critically acclaimed Timeless Loving (Level 1) : Intro to SkyDancing Tantra is designed for people ready for greater aliveness, love, and consciousness in their intimate relating and daily lives. Whether you're new to Tantra or experienced, Timeless Loving will enrich your life and loving. Expand your sexual energy and deepen the spiritual connection with yourself, your partnership and all of life! This experiential seminar is a fun and safe way to begin your Tantric journey. Lodging Options: The beautiful Guest House Retreat offers elegant and cozy accommodations surrounded by nature. All accommodations offer their own private bathrooms. It is recommended that you register early to obtain the lodging of your choice. *If you select RSB1 lodging option, we will upgrade your accommodation to single-occupancy if available. Deposit: $350 per person; full payment due for registrations on or after January 10, 2019. Nestled next to thousands of acres of the Cockaponset State Forest about 2 hours from New York City, Guest House Retreat is a wonderful space for our Ecstatic Living seminars. 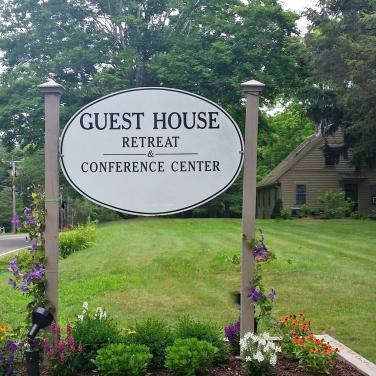 Surrounded by quiet nature with plenty of walking trails, offering gourmet meals for various diets, and elegant and cozy accommodations, we are delighted to teach at Guest House Retreat. Guest House is a beautifully renovated country inn offering a calm and restful atmosphere. It is a place to get away from the busyness of life, to immerse yourself in your connection to nature and to yourself, watching the frogs jump in the pond, relaxing in the sauna, going for wilderness walks, visiting the nearby lake, and more. If you have any questions about Guest House Retreat, please call us directly at 707-987-3456. Meals: The Guest House Retreat's European chef is pleased to offer a gourmet menu that includes fish or poultry at dinner as well as delightful vegetarian options. Menus are imaginative and eclectic, nourishing the body, soothing the soul, and warming the heart. Tuition includes all meals (Friday dinner to Sunday lunch, including snacks and hot/cold drinks). To register by phone, call us at 844-987-3456 (within the USA) or 707-987-3456 (internationally). To register online, please complete the form below. Open to solo and partnered participants of any gender and orientation. No previous experience required. Practices may be done solo, in dyads or triads. Participation level is up to each participant.